2013 Fashion is soaking the 2012 which has just begun and demonstrating industry trends that never sleeps and is always looking beyond, to bring us ever new and surprising innovative proposals. 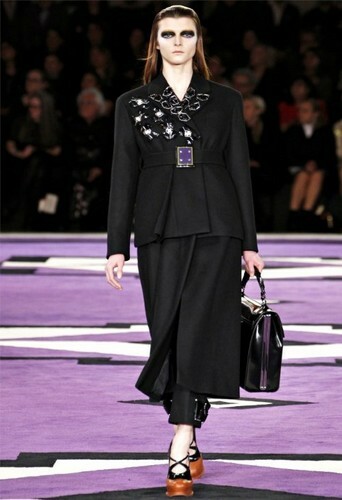 A clear example of this is the Prada clothing presents for the winter season 2013. The gateway of the brand offered a few tantalizing trends for winter and others less so. A segment clearly opted for functionality, shelter and comfort of women, while another, dropped the coat to raise its game design. In this first part we saw a segment that is operated primarily black in color, combined with all kinds of accessories in blazers, blouses and skirts, which give more sophistication to the image. They can see clothes that are warm, where long skirts often are accompanied with pants, to strengthen the protection against the cold. Then, pointing to a large segment sets printed in bright colors and many geometric designs, bringing the share of "joy" in the dull days of winter, but at the same time we can see that the pants of the line going to the ankle, so what would be best to go with boots. Finally here's what I mentioned at the beginning: of wool or linen tops, pants covered with a thin and long skirt. Perhaps the idea is interesting but not a tendency to look down the streets without wearing a good coat on top.